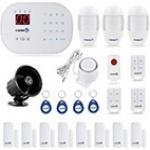 The S02 Security System (“B” Package) a great, economical solution for a security system to protect your medium-sized home or office. This package includes all the items listed here. 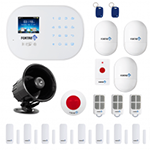 The S02 system allows you to record a brief message which can be played over the phone line when the system dials out in the event of an alarm. You can use your existing landline or VoIP phone line t connect your S02 system and allow it to dial out. Without a phone connection, it will still make the sirens sound, to act as a local alarm. 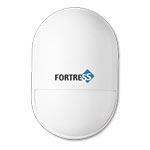 The Fortress S02-B is the ideal kit for anyone wishing to install a security system inside the home. Complete with magnetic sensors for windows and doors, the unit detects any forceable break in as well as any suspicious movement in rooms by means of the passive motion sensors. It also comes with an extra siren for added volume outdoors. 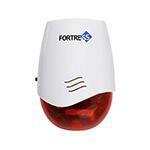 The S02-B comes with three passive motion detectors and ten door contact points. 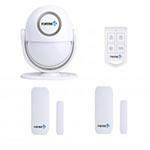 Easy to install and setup, you'll have your own security alarm system running in no time! Fully programmable, the S02-B will automatically call a designated number in case the security system is breached. It can also be used to play a recorded message or custom sound. 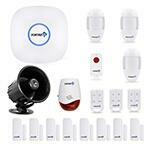 Worried there is someone in your house? Call the system from your phone and actually listen to what's going on. Deactivate the device by punching in the number on the keypad, or disarm before you even get in the front door with one of the three supplied keyfobs. A panic button also sounds the alarm if you suspect an intruder in your own home. Purchase Additional Accessories. Any accessories purchased with this package will be programmed for you! easy installation. We bought an SO2 package which all parts were suppposed to be pre-programmed to the base unit. We found 1 motion detector and 3 key fobs which were not linked to the base and had to program them once installed. This was easily fixed by following the installation guide. I looked at all the options for a home security system and the reviews were one horror story after another. We settled on a self monitored system since where we live the police response is 10 to 20 minutes and knowing that if the alarm goes off when we are at home we need to be able to deal with it, which we are. We started to go with one of the systems that is highly advertised and found that their customer service is null and void. 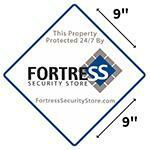 Doing more research I found Fortress Security Store and found that their customer service was far better than any company I had looked at. We decided to go with the S02B product that gave us a better value and more protection than the highly advertised products. The ordering was easy and delivery was fast. 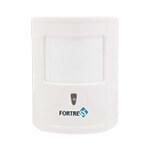 I had some questions on installing the product that was answered imediately, the customer service is over the top and I would highly recommend Fortress Security. The product was very simple to install and works as advertised. The instructions that came with the system combined with the quick response from customer service makes the product easy and simple to install. I will recommend this company and product to all my family and friends. Top top top A+++ rating for customer support!! (Really) My review says it all. I have had to call support a few times. (When instructions say one second it means one second!) I am mid 60’s and been a A.C. Service tech and have worked with lots of support/tech people. Everyone I have spoken with at fortress has beeen just great! Good thing not cheap — cheap Thing not good. I received my system in excellent condition. Easy following of directions and installation was a simple process. I did call customer service with one question which was answered in short time (five minute wait or less). Knowledgeable service rep and friendly too.....Really like the fact this system has three motion detectors and two sirens. If a door or window contact fails, the motion detectors are great backups, especially in an open floorpan type home. Highly recommend this system. Easy site to navigate. I suggest adding some color to the webpages. Too much white. Seems alot of website have this "too white" issue. Anyway looking forward to seeing my security system in action in my home. Have used you before, always pleased! I have an old Radio Shack security system that has an auto-dialer. Picked it up back in 2001 after my house was broken into. Since then, I was busted in a 2nd time, and the alarm scared them off (in addition to me calling the house!). My old unit finally stopped working. I have a camera system too but any SMS notifications to my phone tend to go unnoticed versus a phone a call from my house. I love the fact that there are no monthly service fees for an autodialer. I am very pleased with your products and service. Where can I find a video about changing the batteries on my motion censor? Can you program this system with the same signal as my so2-b I purchased in February? You can purchase accessories to an existing system, and once they arrive our Support Team can assist you in programming them if needed! However, if you buy two systems, then the other main panel would be considered a second, separate system. If you're looking for a second keypad that you can use as part of the same system, we recommend the RFID Wireless Secondary Keypad instead! 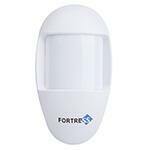 Hello, the motion detectors use a 9 volt and the contacts use a 23A.